We slept in on the morning of July 2. After our 14-hour summit day, it was easy to snuggle down in our sleeping bags inside our “Barrel” shelter and let our bodies recover. After a huge breakfast, the last meal prepared for us by Anastasia was packed into our duffel bags and we began our trip down to the valley. to load up and go down. This time we rode a snow cat first, then we boarded the two new covered gondolas for a quick ride down. A tradition with Berg Adventures groups after an Elbrus climb is to stop in Cheget to enjoy a local barbeque and sit around in the low altitude to savor our success. The showers can wait! Shasilick (fresh lamb barbeque) and Hiching, a local Caucasus cheese bread, along with cold beer seemed just right after yesterday’s long cold climb. A trip to Cheget always involves shopping, and as soon as we arrived the team members were off to acquire their Mount Elbrus tee shirts. Mo had insisted that none of us purchase Elbrus shirts before we had actually reached the summit, lest we jinx our chances for success. By four in the afternoon we were back in the hotel having our hot showers. The timing was good because the sauna opened at 5pm. The group sat around in the steam and at the pool area relaxing, our sore muscles soothed. 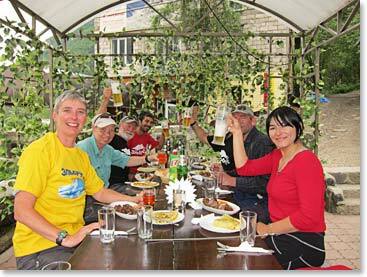 July 2 was our last night in the Caucasus and we went to one of our favorite restaurants to have still more barbeque. We enjoyed grilled vegetables and chicken along with some delicious lamb this time. 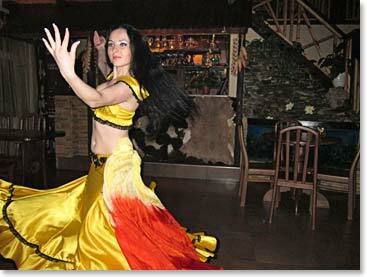 As a farewell to the region the daughter to the restaurant manager, who is an extremely skilled local dancer, entertained us. On the morning of July 3, Karina and Vladimir accompanied us to Mineralnye Vody where we caught our flight back to Moscow. Walking Red Square that evening was fascinating and a bit surreal. 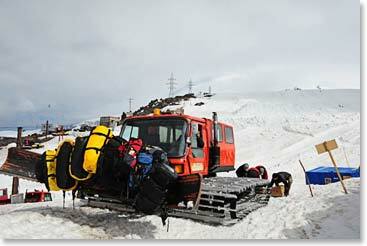 We’d already come so far from the Caucasus Mountains and the Elbrus Region, but we were still in Russia! It seemed we had stepped into a whole other time. Cheget is a tradition lunch stop for us coming off the mountain. 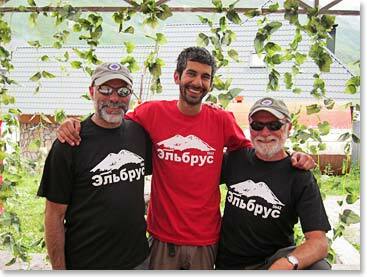 Bill, Mo and Tom proudly wear their Elbrus tee shirts. Cultural dance at our farewell dinner. 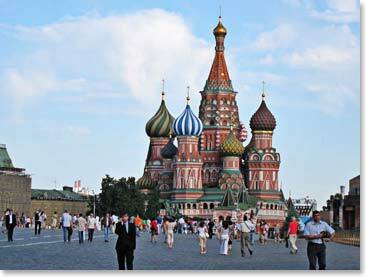 Moscow! By the evening of July 3rd we’d returned to the 21st century.